CBD made a huge shift in the USA back in January 2019. The Farm bill passed allowing CBD to be 100% legal in all 50 states. Because of this shift in our economy CBD is now 100% decriminalized. Making CBD all the rave! We are seeing it pop up in so many products it can be challenging to know what is a good and effective source. With all plant medicine the values stay the same. Do you know and trust the source where the CBD is coming from? Is it pesticide free? Is it sustainably harvested? Many of these questions are rising and worth exploring before you start using CBD in any of your formulas. In this CBD Sore Muscle Rub blend we have shortened the middleman and gone straight to trusted sources that product oil blends. You can create your own oil infusions and have many oils on hand for crafting your custom blends; this method is just a simpler way of creating a product with reliably sourced products. However, I have included directions on creating your own herbal oil infusion if you are curious to do it on your own. Topically, CBD seems to have a big impact with folks that are having sore muscles or aches and pains. In combination with other muscle soothing plants you have a dynamic combo. Make a big batch of this Rub for yourself and pass it on to your friends who need a little also! 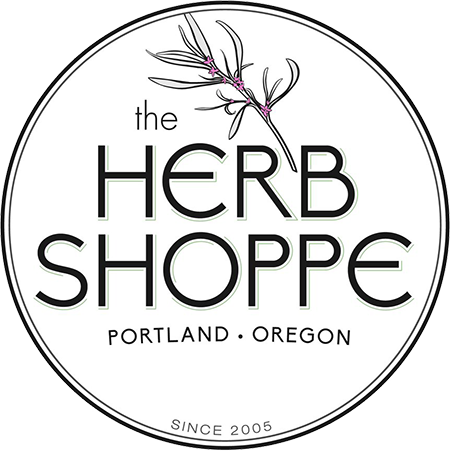 Watch me live on KGW8 on March 27th, at 5pm, for a live clip from The Herb Shoppe for this month’s product making tip! 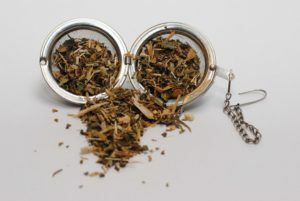 Place herb blend (CBD, Arnica, Hops, etc.) into oven safe glass container. Put base oil blend on top of bulk herbs. Make sure that you cover everything with about an inch of oil on top of herbs. A good ratio to start with is a 1/10 ratio for oil infusion. Let sit in oven on lowest setting (around 200 or 225 degrees), uncover and let infusion happen for about 2 hours. Keep an eye on it so that it doesn’t burn. If your oven seems to hot then crack the door. After 2 hours, remove from the oven and let cool to room temperature. Take cheesecloth and strain all the herbs from the oil. Don’t leave any herbs in the oil or it will spoil your batch. Take all your herbal oils CBD, Arnica, Hops, and Muscle Ease Oil and put in a double boiler and follow below. Take your oil infusion and put in top pan of a double boiler. Add your wax (I typically use beeswax or soy wax) or butters such as cocoa butter. Melt all together. One of my favorite tricks for getting the appropriate consistency is the spoon trick. Take your melted blend and put a small amount on a spoon. Place in the fridge for about 5 min. pull it out and see how the salve feels. If it’s to hard then add a little more oil, if it’s to soft add a little more wax. 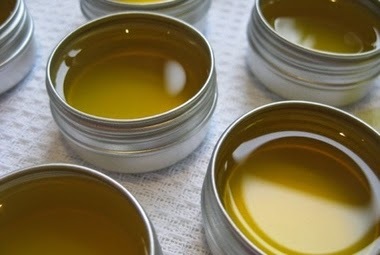 Take base oil and wax blend and pour into your containers. Let sit over night. Don’t move them for 24 hours if possible to let them completely harden. We take great pleasure in creating products and recipes for you. However, if you are interested in going more in depth to make all your own herbal products get signed up for THS Make Your Own: Herbal Product Series, Beginning in March 2019. In this 4 month, hand-on, program we will dive into making an assortment of products for your hair, skin, body and home. Space is limited. Secure your spot today!